I wasn’t sure where I was going to go, just that I needed to go. The paucity of cycling for this year was exacerbated by my Jury Duty for which I ended up taking the bus into Seattle for 7 days out of 10. Thus I was not even getting in my typical commute ride. Jury Duty was pretty interesting though and I did quite enjoy being able to walk around the city during our breaks, so while I missed the cyclo-commuting it was overall a valuable experience.. The trial ended the Thursday before Memorial Day Weekend and I was finally able to get back on the bicycle. The weekend had been sort of mixed weatherwise and I’d planned to get out on Sunday which was supposed to be the nicest day. However it turned out to be pretty windy and rainy and I busied myself with other activities. By Monday, Memorial Day itself, I just had to get out there and while the day was initially cloudy, it cleared up as my ride went on. 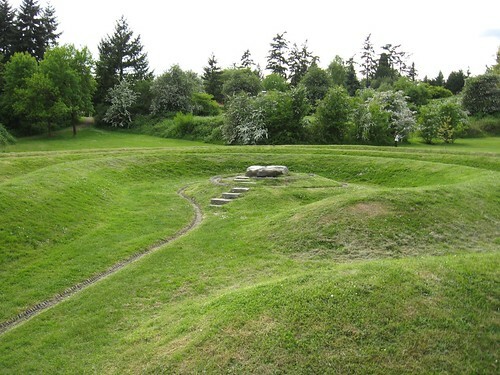 I’ve pointed out in the past that there are limited directions that one can head out from my house, so I chose the easterly option up Rose Hill. I’d left around lunch time so I had grabbed a sandwich and wanting to eat it rather soon-ish I went to Viewpoint Park which is on the plateau of Rose Hill and overlooks I-520. I’ve ridden past this park many times and even poked my nose into it, but as it’s so close to my house (about 5 miles) it was always too close to stop so I’ve never really explored it. Thus this was a bit of new territory practically within walking distance of my house. It is a nice bit of woods with well laid out trails, though clearly orientated toward walking. The trails are covered with bark, which is rideable but discourages any “bombing” of. I rode down to the overlook and had my lunch. The downside of having done as little riding this year as I’ve had is that one’s endurance is lower and thus ones options decline. Of course frequent rides that push beyond your current endurance is the only way to build it up, but for any given ride you have to keep that in consideration. I wasn’t particularly interested in any of the standard local rides and a lot of my favorites I thought might be a little ambitious at this point. So I kept riding with only vague ideas where I’d go. 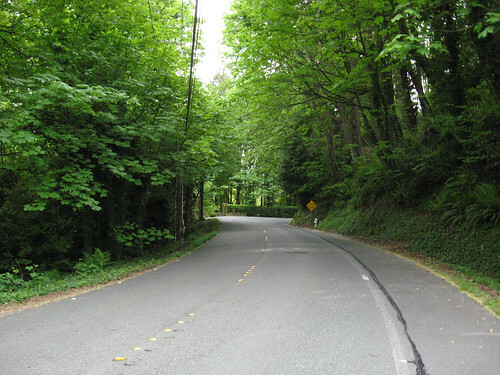 I ended up riding on West Lake Sammamish Parkway (which actually I have yet to do this year, though I’ve ridden on the East side at least once) but bailed off it on a road I’d not take before just about as it arrives at Issaquah. 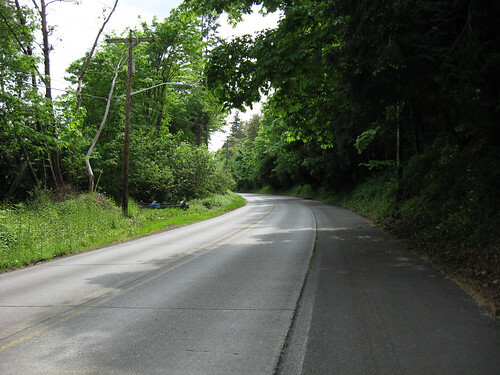 This “new” road led almost directly to a road that I had been on before on that intersected with the I-90 trail. 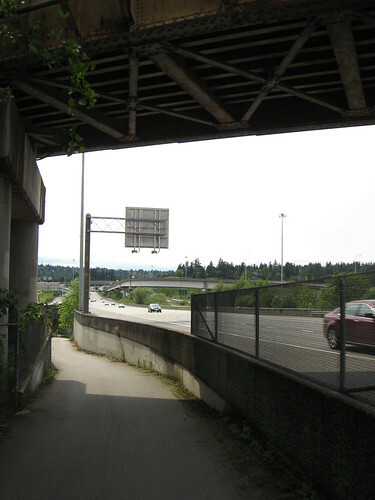 I had a choice then – take the I-90 trail which leads to several options (Lake Washington Loop, Mercer Island, Seattle), or strike out through Newport which also has its options ( it also intersects Lake Washington Loop, you can head east to May Valley, continue south to Renton &c). I was uncertain so I rode the trail figure that gave the most options (and I’d done May Valley just last month). The clouds were burning off by this time and it was now really pleasant riding. 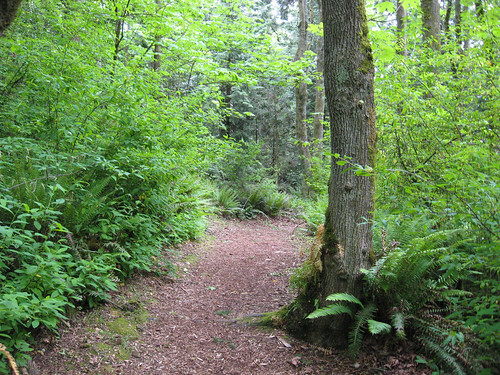 The trail, while somewhat urban, still allows one to contemplate ones upcoming choices and by the time I arrived at it’s intersection with the Lake Washington Loop, I’d decided to press on to Mercer Island. Of course from Mercer Island one can do the loop around the island, cross into Seattle and go Clockwise or Counter-clockwise on the Lake Washington Loop and so on. 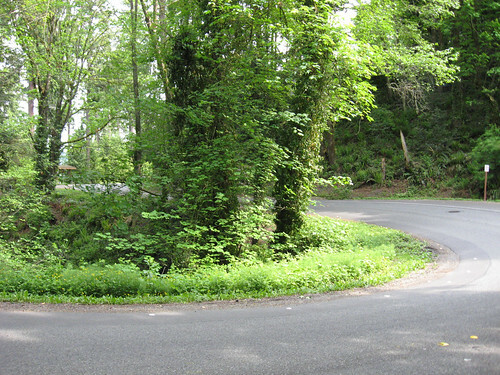 But I’d decided to do the Mercer Island Loop. Now I feel I should digress a little and talk about this particular choice. For such a close ride ( a bit over 8 miles from home) you’d think I’d have done it frequently, especially as I ramp up in a new year. But the fact is I’ve rarely done it – twice that I can recall. The reason for this is that I think of it as one of the frequent “roadie rides” and thus is a bit more trafficked than I prefer. While I have nothing against roadies – to each their own! – I consider my ride style pretty far from them. Roadies are always “training” for something, whether it be longer club rides, Cat n+1 races or whatever. I’m usually out looking for new places, seeing how things change at different times of the year, in short I soak in the scenery and am glad that I get some exercise whilst I do so. On every ride I try to keep in a touring mindset – the bicycle is the best way to experience place not the end in and of itself. When one is touring you have to be completely self-suffecient and I maintain that one all my rides. I can repair about anything beyond a frame failure, wheel taco or other catastrophic failure. Roadies on the other hand barely seem to carry gear to fix a flat. Maybe a spare tube and a pump stuck in their jersey back pocket. This I think limits most of them to sticking to routes that aren’t too far that they can find a shop or get picked up by someone without really putting them out. If you are a Seattle area roadie then, once you move on from trails, the Lake Washington, Loop and the Mercer Island Loops are the closest and easiest to get right on to. So you see a lot of roadies there, which again more power to ’em, I just enjoy riding where I see few cars and fewer cyclists. 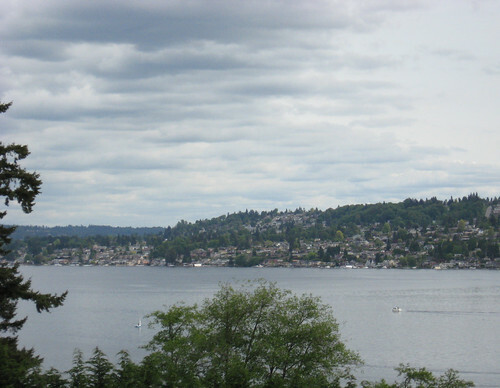 Anyway I went pretty far afield there, but that is why I’ve done Mercer Island so little. Now Mercer Island is a little island in Lake Washington that being right on the edge of Seattle and being mostly lakefront is pretty tony. But the road around the south side of the island is really enjoyable to ride on – all twisty roads with its ups and downs, but no real killer hills. Since my previous two rides here had been counter-clockwise for this one I chose to go clockwise. Going this direction gets you into the good stuff right off. There are this switchbacks that go around coves and bays as you can see in the above picture that are just tons of fun to ride around. I noticed for the first time that while in the counter-clockwise rout there is no shoulder (which isn’t much of a problem) there is in the clockwise direction. Nice. I really had a good time riding this part of the island. You are mostly in the woods on the southern half of the ride and it is only as you approach the west side of the Island does it open up a bit. Of course every inch (barring a park or two) along the waterfront is occupied by high end housing so there really aren’t a lot of amazing views. Still it opens up now and again and you can see some of the neighborhoods of Seattle on the east side of Capitol Hill. Of course once the views open up a bit the south (and most interesting) part of the ride is about over. The only really hills, and even these aren’t tough at all, are then the climb to the point where you cross I-90. After that point you are on the north side of the island which is only about a four mile ride. I often ride these roads for as I’ve intimated before I tend to get off the I-90 trail even when I’m just crossing the island. I was due for a break at this point and I rode into Luther Burbank Park to take it. 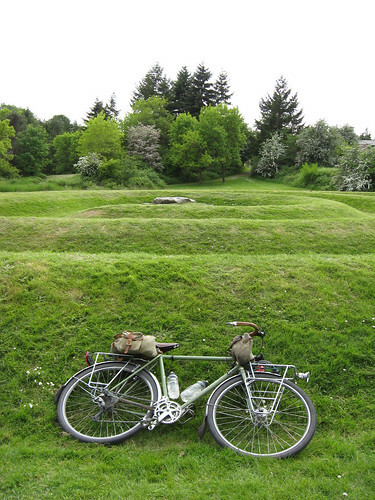 I parked my ride at my favorite part of Luther Burbank Park: John Hoge’s earthwork, The Source and hung out for a while. This whole ride, like many of my rides, I tried to treat like a day on tour – stopping at interesting looking places, taking breaks at places with things to see and generally enjoying being outside and not just ride, ride, ride. 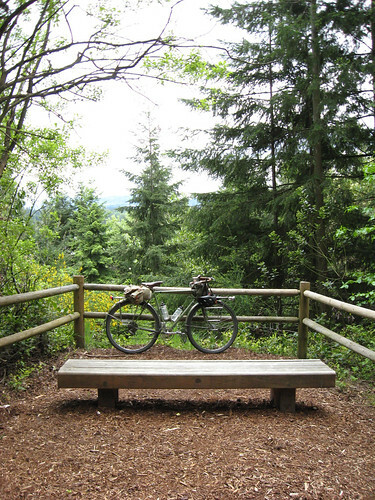 I hadn’t really ridden to any places I hadn’t been aware of, but I mixed it up by finally fully exploring Viewpoint Park, doing the Mercer Island Loop clockwise and stringing together a varied and mixed ride. There was a bit of offroad, a bit of trail, a bit of city riding, an island loop and two separate lakes visited. My legs were feeling it around forty miles, which is pretty sad, but I pushed on for another five which I always feel is a good thing to do to increase ones endurance. The next ride I can push it to further and hopefully soon enough I’ll be riding further afield. See all my photos from this ride in my Memorial Day 2011 Flickr set.